The evening of festivities will begin with performances by Asia and her Arabesque troupe of dancers. Asia brings a diverse background and many years of study in Mid Eastern choreographies, including folkloric and fantasy pieces based on mythology. Arabesque features over fifteen dancers wearing ornate costumes performing a variety of beautiful and unusual dances. As dusk falls, the Del Fuego Dance Troupe will take the stage. 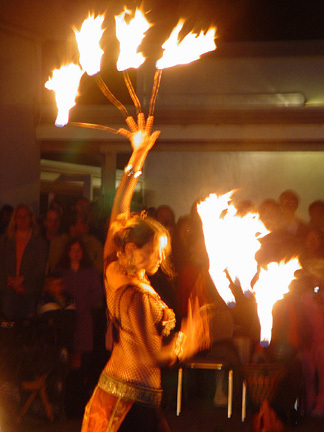 Del Fuego is a coastside troupe of dancers who create powerful performances with fire in motion, fusing tribal belly dance with the ancient art of poi. Still practiced by the Mouri people, poi is a twirling, spinning dance of fire. Del Fuego adds fire-tipped fingers and fire belts, dancing in the dark to deep groove drums. The fusion of ethnic dance and their skill at spinning fire is mesmerizing. The reception will also feature live music by Vivace - an eclectic mix of classical and Brazilian works as well as jazz favorites by the musical duo of Rob Hughes of Pacifica on flute and saxophone, and Michael Schillaci of San Francisco on acoustic and steel string guitars. 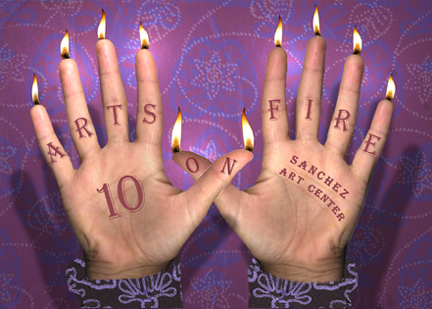 In honor of our 10th anniversary the Sanchez Art Center is offering a limited edition Arts on Fire Pin. The flaming heart image, representing the passion and vibrancy of the arts, has been forged into a 2" enamel cloisonne pin. There are only 100 of these beautiful pins available. 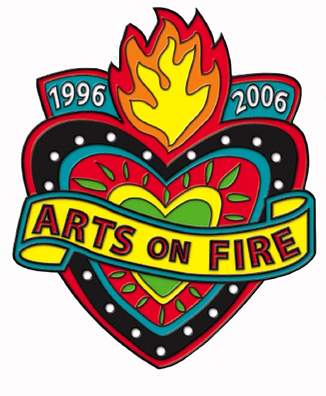 In addition, the art center will have a fun Tattoo Parlor Booth at Arts on Fire reception. For only a dollar you can get a rub-on tattoo of this flaming heart image. As you walk in the door to Arts on Fire look for attendants who will be making a special, one-time offer. 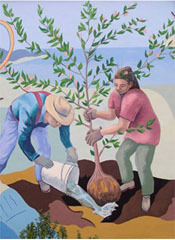 The first 100 people who make a donation in support of the Sanchez Art Center for $20 or more will receive an 18" poster of the Sanchez Art Center Mural, an Arts on Fire Pin, and 4 tattoos all rolled up and tied with a ribbon. These commemorative Arts on Fire pins promise to go quickly, so get 'em while they're hot.